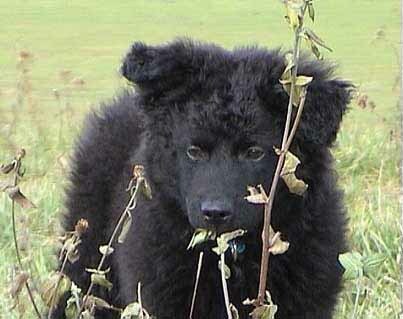 UTILISATION: This breed possesses an excellent hereditary instinct for herding all kind of livestock but also he could be easily trained for all kind of dog sports. He is very good watchdog, loveable house pet. GENERAL APPEARANCE: Croatian Sheepdog is of lower medium height. Its base color is black. Short hairs on the head and legs characterize the breed. BEHAVIOUR/TEMPERAMENT: It is a lithe, keen and modest shepherds dog, which can easily be trained. IMPORTANT PROPORTIONS: The body length exceeds the height at the withers for approximately 10%, so the dog is of somewhat elongated square shape. Generally: The head is relatively light, lean and wedge shaped. The ratio between the muzzle and the skull is 9 : 11. The total length of the head is about 20 cm. Skull: Slightly rounded skull tapering towards the nose. The eyebrow arches are not pronounced. The cheeks are rounded. The occiput can be distinct. Nose: Always black and in the line with the nose ridge. Muzzle: Lean, nose ridge looking from the profile is straight and is a wedge-shaped extension of the skull. The lower jaw is well developed and forms a harmonious whole with line of the nose ridge. The muzzle is neither pointed nor square. Teeth: Good developed, complete scissors bite. Level bite is acceptable but not desirable. Lips: Dry, close fitting and supple. The visible lip pigment is black. Corner of the mouth is tight. Eyes: Chestnut brown to black, medium in size, almond-shaped, they give lively expression to the dog, set horizontally. The rims of the eyelids are dark pigmented and tight, fit close to the eyeballs. Ears: Triangular in shape, medium-sized, erect or semi-erect, somewhat set to the side. Erect ears are more desirable. Ear cropping is not allowed. NECK: Slightly rises above the back line, the upper and lower lines of the neck are straight. Moderately long, it is of medium strength, deep and well rounded, muscular. The skin is without dewlap and is covered with a dense coat. Withers: Not pronounced. The transition to the neck is gradual. Back: Straight, short and muscular. Loin: Short and firmly coupled. Chest: Medium long, broad and deep enough. Ribs sprung, forechest slightly pronounced. The transition to the neck is in a straight line. Belly: Slightly tucked-up. The loins are full and sturdy. Croup: Medium long, slightly sloping down, muscular and fairly broad. TAIL: Set medium high, with thick and long hairs, in repose hangs relaxed or is carried at back level. In attention it is carried above the back line. There are dogs born without or with short tail, or the tail is docked so that in an adult male it is about 4 cm long. FOREQUARTERS: The legs are straight, parallel looking from front and of medium length. Angulation of the front legs is more opened, the dog stands steeper. Shoulder blades are medium long and muscular, somewhat set steeper. The upper arm is relatively short. The forearm is long and muscular. Bones are lighter. Pasterns dry, indistinct, short and not completely vertical. The feet are small, strong, semi-rabbit-like. The toes are well knitted, well and firmly cushioned. The nails are black or gray. HINDQUARTERS: The hind legs are medium-angulated. From behind, the legs are parallel. The lower thigh is long and the hock is set lower. The upper thigh is of medium width, well muscled. The hocks are dry and distinct, well angulated. Hind feet are the same as the front ones, small and sturdy though somewhat elongated. Dewclaws are removed. GAIT/MOVEMENT: The Croatian Sheepdog moves in briskly trot with moderately long steps. TEXTURE: The length of hair on the back is between 7 and 14 cm. The foreface is always shorthaired. The ears are shorthaired on the outside and longhaired on the inside. The backside of the forelegs has longer hairs down to pastern and forms feathering. The hind legs have pronounced feathering from the buttocks to the hocks. The coat is relatively soft, wavy to curly, but mustnt be woolly. The undercoat must be dense. COLOR: The base color of the coat is black. A few white hairs can be tolerated. White markings on the head, body and tail arent permissible, but small white markings are permissible on the throat and the forechest. White markings on the toes or the legs are permissible but undesirable. White legs up to pasterns lower the dogs marks on shows. HEIGHT: The height at withers in males and females is between 40 to 50 cm. FAULTS: Any departure from the foregoing points must be considered a fault and the seriousness with which the fault should be regarded should be in exact proportion to its degree. 9. Height at the withers below or over the one in Standard.